Keep your movies nicely organized in a small space! Media Companion is the original free to use Movie/TV Show manager and organizer that offers full XBMC integration. How do you organize your Blu Ray and DVD collections? With Media Companion it`s very easy! Simply put, Media Companion offers the facility to gather information from the Internet and make this information available to you in an organized manner. The information collected includes such things as posters, backdrops, plot summary,actors and actor images, ratings etc, and are placed with your video files for easy addition to your library. 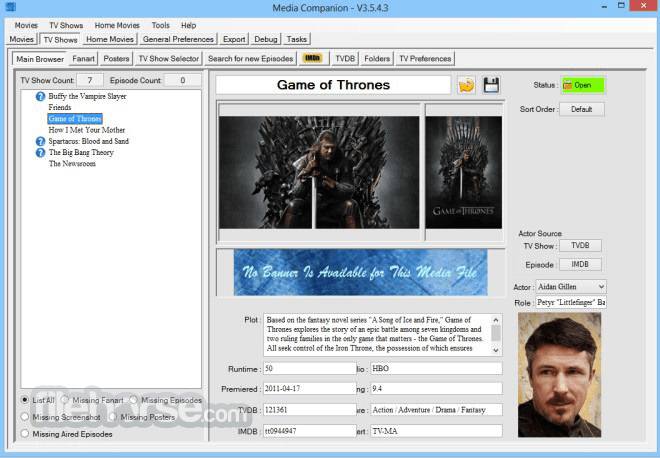 Media Companion Currently supports Movies and TV Shows!